Healthy Campus Week is back, with loads of free activities and events to keep you in tip top condition this 19 - 23 November. Here in the Sport and Recreation Service at Middlesex University we look to dedicate one week every year to raise awareness about important issues to do with your health and wellbeing. Looking after your health while you work and study is a factor in enhancing academic performance. Join the fast growing community at Middlesex MDXMoves. Sign up today and start earning rewards simply by moving a little more. Use your phone as a fitness tracker to start earning free stuff like Costa coffee, gym memberships, discounts to online retailers and more. Find out more about MDXMoves and how to sign up on our pages on unihub. Take Part in the Healthy Campus Week Treasure Hunt on Tuesday 20 November. Meet at The front of the QUAD at 12.00pm where full instructions / clues will be given out. 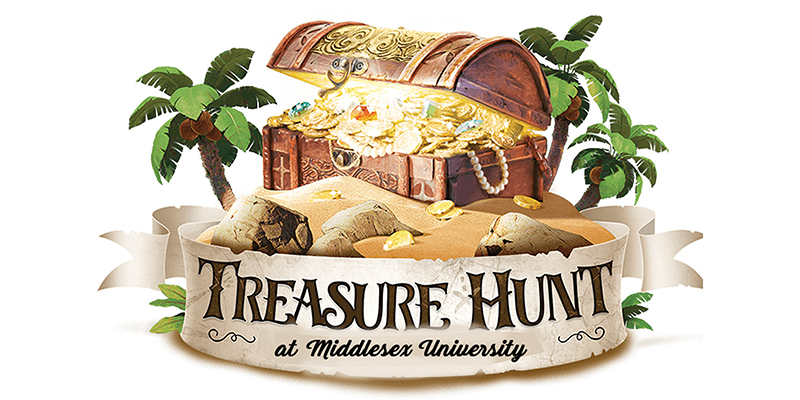 Use the clues to find the hidden TREASURE on campus- star prize for the winning team / person. Loads of goodies up for grabs, you just have to decipher the clues and unscramble the riddles to find the hidden treasure. Plus a great way to build up your MDX Moves points on the way! Hendon, London NW4 1PX) from 6:45am - 8:30pm during public swim sessions. Simply show your Middlesex ID for free entry. We have a variety of exciting classes and activities running in our leisure programme which we are keen for you to try for free this Healthy Campus Week. For a full list visit the sport pages on our website. We are also offering a week of free access to our This MDX Girl Can programme, visit our pages on unihub for more information. Simply contact The Fitness Pod reception on 020 8411 6343 to book your free sessions. The BIG WALK is taking place on Wednesday 21 November and we are looking to get as many people as possible along to this event. Please meet outside the front of the Quad for 12.25pm for a lunchtime stroll around Sunny Hill Park. It's tipped to be the largest lunchtime walk on record! Join in our lunchtime jog on Tuesday at 12:25pm. Meet already changed and ready to go at The Fitness Pod reception. Neck and Shoulder massage treatments are conducted in a seated position where you keep your clothes on. Sessions last approximately 15 minutes. We are offering sessions on the following days / times (subject to availability). Spaces are limited. Please book your session by contacting The Fitness Pod reception on 020 8411 6343. Get your blood pressure and body composition measured, and receive feedback from one of our trained instructors. Appointments ( 30 mins) will take place in the locations below and need to be booked in advance by calling The Fitness Pod on 020 8411 6343. Your health and wellbeing is important to us. That’s why during Healthy Campus Week The Fitness Pod are offering you a free health check. Our staff will be visiting offices to carry out free blood pressure and body fat checks. If you happen to miss us, then please feel free to get in touch to arrange an appointment on 020 8411 6343. Book a 60 minute PT session with our resident Fitness Pod instructors at just half price. Sessions reduced to just £15. Booking essential. Contact the Fitness Pod reception or email thefitnesspod@mdx.ac.uk or 020 8411 6343. Thursday 22 November 10.00am - 2.30pm. We will have loads of fun activities and tips on getting active and eating and keeping healthy. Don’t miss it! Attend one of the free sessions below and you will be entered into a draw for an introductory 3 month sports membership to The Fitness Pod. Why not try out our designated social staff football this week? We run a variety of FREE, just turn up and play, social sports sessions on Wednesday and Friday afternoons on campus. Activities take place on the 3G pitches, MAC courts and Terrace outside MDX House. All activities are completely free, and all equipment is provided- simply turn up and play. Contact the sports office in MDX House to see what activities are running this week. Visit the website for more information.